One of the most unusual commercial developments in South Africa in recent years has been the development of the Welwitschia Country Market at the Damdoryn crossroads, a kilometer from the Hartbeespoort Dam wall. Built under the shade of giant old trees the market evolved from the idea that small is neat and good. Grouped around a charming and imaginative aviary - the delight of children of all ages - is a collection of forty wooden shops and a covered area housing a wide range of merchandise. The brick paved streets of the village allow for pleasant meandering through the stalls and shops, with places to sit and enjoy a rustic atmosphere. The market not only caters for the tourist trade but also offers local visitors a useful and refreshingly different place to do some shopping. 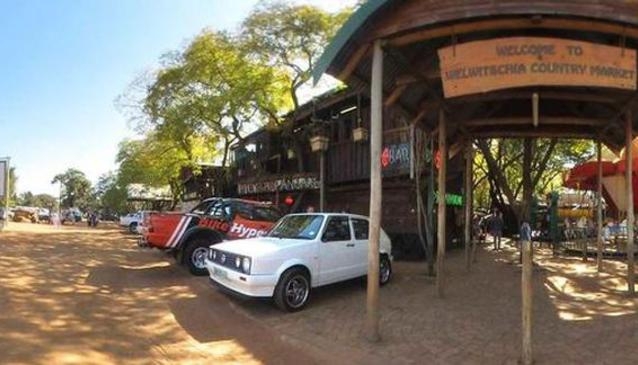 An attractive bush pub and a family restaurant, called The Upperdeck Restaurant, is a getaway where you will always feel warmly welcomed by great food and drink, accompanied by the ambient buzz of well known live music performers. Pick a Pancake and The Country Griller, also on the grounds, offer a variety of light meals at excellent prices. The market offers good parking and clean toilet facilities, a playground for children and additional entertainment on Sundays & all public holidays.